I’ve become accustomed to American cars around Wrocław, but when I saw this behemoth of a Chevrolet it definitely got my attention. It could have also been the huge Ronald McDonald on the side, kind of hard to miss that. Turns out McDonald’s is doing their part in helping kids around Poland. 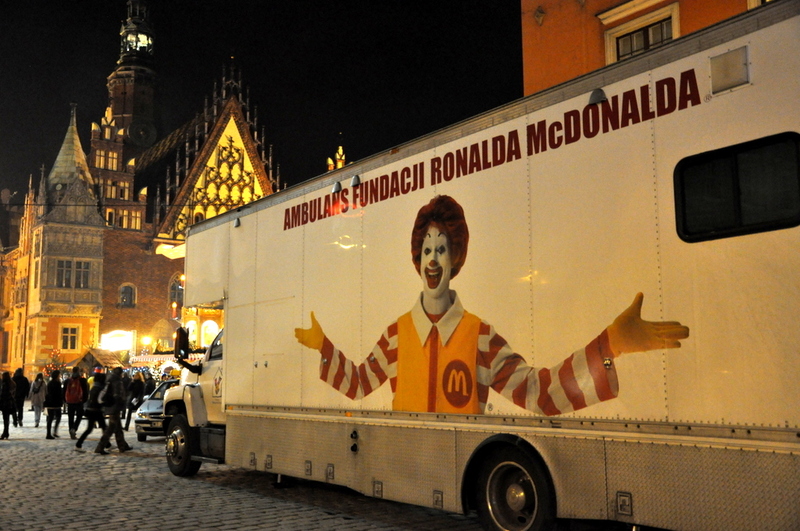 This truck, with a big “The Ronald McDonald Foundation Ambulance” sign on it, was parked right next to a McDonald’s restaurant in Wrocław’s center square. Karolina said it usually serves as a blood drive vehicle, but this time the sign on it mentioned some sort of cancer screening for kids, with a sign that said “No! to cancer in children”. It’s really hard for me to say “Thanks McDonalds!” Their restaurant here is always full of kids, and we all know how healthy their hamburgers are for children. I have mixed feelings about McDonald’s saving some lives while negatively impacting so many others. I guess they could have done without the ambulance at all, so I’ll give them credit for trying. Isn’t it up to the parents to control that – not MacDonalds or the government? Carl and Judy got 2 inches of snow at their house in Santa Clarita. Ha, when I read the title of this blog entry, I thought it was an ambulance for people who were really craving McDonald’s food right then and there and didn’t want to walk to the next store. I didn’t know the ambulance was (semi-) serious!